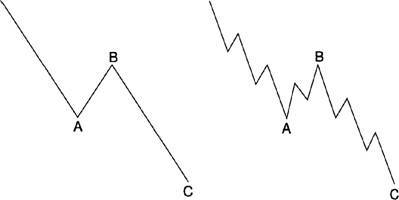 Occasionally zigzags will occur twice, or at most, three times in succession, particularly when the first zigzag falls short of a normal target. In these cases, each zigzag is separated by an intervening "three," producing what is called a double zigzag (see Figure 1-26) or triple zigzag. 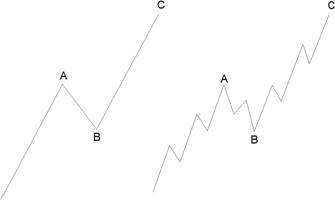 These formations are analogous to the extension of an impulse wave but are less common. What might be called "double flats" do occur. However, Elliott categorized such formations as "double threes," a term we discuss in Lesson 9. The word "flat" is used as a catchall name for any A-B-C correction that subdivides into a 3-3-5. In Elliott literature, however, three types of 3-3-5 corrections have been identified by differences in their overall shape. 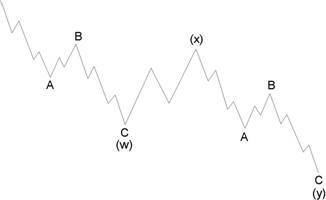 In a regular flat correction, wave B terminates about at the level of the beginning of wave A, and wave C terminates a slight bit past the end of wave A, as we have shown in Figures 1-29 through 1-32. Far more common, however, is the variety called an expanded flat, which contains a price extreme beyond that of the preceding impulse wave. Elliott called this variation an "irregular" flat, although the word is inappropriate as they are actually far more common than "regular" flats. Ready to learn more about how to use the Wave Principle? EWI’s Basic Tutorial is written to give you all that you need to know to get started on your own wave analysis. To get access to this useful Basic Tutorial, sign up to become a Club EWI member here.